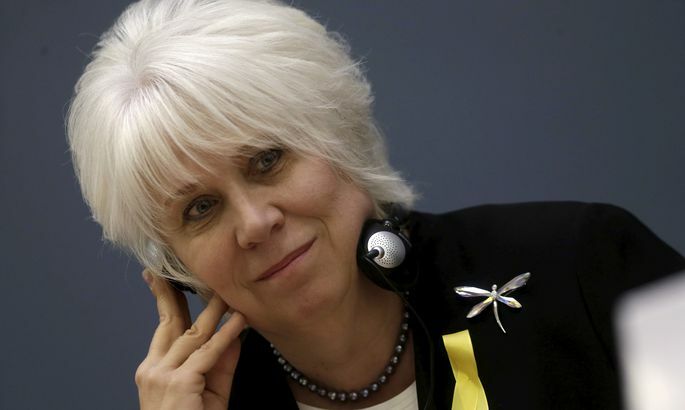 A poll shows foreign minister Marina Kaljurand as obvious favorite as presidential candidate. In Estonia, every fifth individual would like to see her in the role. 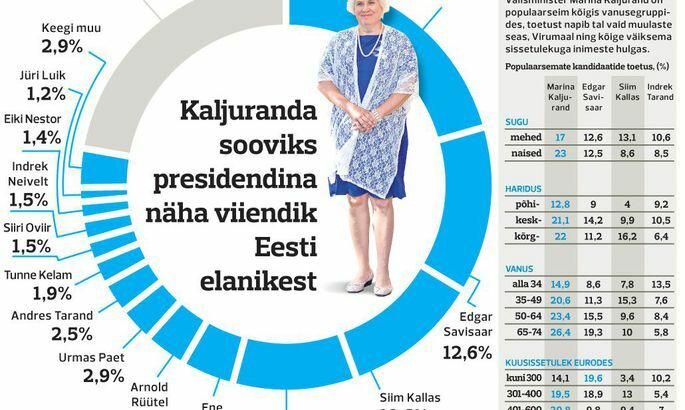 A fresh poll ordered by Postimees and carried out by TNS Emor regarding popularity of presidential candidates revealed Marina Kaljurand continuing as frontrunner, in December supported by 20.3 percent of Estonia’s inhabitants aged 15–74. Herewith, good to remember that only in March her popularity stood at 10.4 percent and rose to 14.3 percent by August. TNS Emor research expert Aivar Voog said Mr Kaljurand has snatched a couple of percent from every other candidate. «From the candidates presented by the questionnaire, Marina Kaljurand is the obvious forerunner not the favourite only among those of other nationalities, worse off financially, living in Tallinn and Virumaa,» said Mr Voog. In battle for second best, Edgar Savisaar has pulled ahead of Siim Kallas with December rating at 12.6 percent. In March and August, Mr Savisaar ranked at 13 and 13.2 percent of popularity, respectively. Siim Kallas pocketed 10.6 percent (March 13 and August 11.2 percent). Indrek Tarand also made it near a tenth of respondents at 9.5 percent (March 9.6, August 10.1). The remaining candidates are at 4 percent of below. Ms Kaljurand is most popular (30.8 percent) among those earning €400.01–€600. As was expected, Mr Savisaar stands tallest in the eyes of those of other nationalities (35.4 percent). Mr Kallas is equally top popular among the highly educated and over €900 per family member earners (16.2 percent). Indrek Tarand is best liked by people refusing to reveal their income. Chairman of Reform Taavi Rõivas said that though President is elected at Riigikogu of electing committee, popular opinion is vitally important. «It being too early to be talking about official candidates, rest assured Reform will not support Edgar Savisaar not his previous presidential candidate Indrek Tarand,» said Mr Rõivas commenting the four frontrunners. Andres Herkel of the Free says a candidate must enjoy cross-party popularity and international authority. He also appreciates independence and ability to see the bigger picture about where Estonia ought to be headed. «The selection of names suggested by Postimees is not too probable,» added Mr Herkel while commenting whom they would favour. EKRE faction head at Riigikogu, Martin Helme thinks a presidential candidate needs to be one who enjoys the support of majority of the people. «The individual should not trigger doubts about which country’s rights he represents. We want to be sure that the heart of Estonia’s President beats in harmony with we the people,» said Mr Helme who was also unable to support any of the personas presented. Soc Dems and IRL declined from comments, saying the issue has not been discussed at the parties as yet. Centre’s secretary-general Priit Toobal again underlined they would prefer direct elections of the president while declining to speculate about their preferences. Postimees asked TNS Emor to additionally inquire how the latest news about President Toomas Hendrik Ilves have affected the reputation of the Office. While 64.6 percent said their opinion had not changed, 26.3 percent it rather worsened. The reputation declined the most (35.2 percent) among voters aged 65–74. Those least affected were up to 34 agers, of whom 72 percent said their trust level regarding the office altered not.